Sound of Music is an American classic providing childhood memories for millions of children nationwide. Thanks to Broadway in Indianapolis, I am giving away two tickets to opening night, Tuesday, January 10, 2017. The show (which is looking to be a sell out all nights) will be performed at Old National Centre. 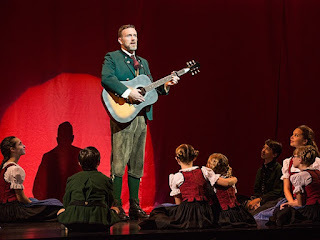 Check back to this site for a full review on Indiana native Ben Davis as Captain Georg von Trapp, and the entire cast. To win, simply share this link on your FB page and state your favorite part of Sound of Music. It could be a character, a song, or even a memory. I will check Sunday night at 9 p.m. on all who have shared the link. Whoever generates the most shares of the link from their FB page, WINS! I will contact you via FB message with details on receiving your tickets. Elizabeth J. Musgrave writes two magazine food and wine columns: Destination Dining and White Linen & Corks,and is a travel, features, food and wine writer, travel and food photographer, and performing arts and restaurant critic. Catch her as the Travel & Leisure Adviser on FOX59 Morning News Show. She also is a speaker, consultant and trainer for hospitality, travel and luxury businesses, P.R., and tourism groups, as well as a radio and television guest and host. Follow her on Twitter @GottaGo, LinkedIn and Facebook.